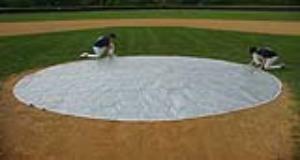 Economical 20' Pitcher's Mound Cover constructed of 6 oz. Silver/White lightweight Poly Fabric. Offers a 2 year prorated warranty. Reinforced perimeters with brass grommets. Ground Stakes Included (7 each ) . NOTE: All covers are cut full size and finish slightly smaller due to seams and hems. Grommets are spaced 3'-4' apart around the perimeter.